Reborn Technology: Return of the sailing cargo ship? As fuel costs grow and worries about finite hydrocarbon fuels increase mankind is finally looking seriously at alternative forms of power it seems. One is to harness the power of the wind to power a ship. Now this may seem familiar! Sail powered commercial ships had largely disappeared from the high seas by the mid-part of the 20th century but now they could be going to make a comeback... kind of. A German company, Beluga Shipping GmbH, has fitted a freighter with a giant kite (which can be described as a kite ship though the company seem to prefer to call it a skysail naturally). The MS Beluga SkySails has been fitted with a paraglider type device with 320m2 sail area that can help pull the ship along in favourable conditions. Computer optimisation and control is used to make the most of the wind and it is hoped this can help reduce fuel consumption by up to 35%. Some are doubting the viability of the scheme according to the news report (some unnamed "experts") and also have voiced concerns over safety though the idea has been used on land vehicles so why not give it a try. Bigger sails are planned. It may look a bit strange but if it can reduce running costs by $6000 a day as is claimed by the company then no one would worry about that! This isn't the first time someone has tried to resurrect the sail for commercial shipping. In the 1970s and 1980s the U.S. and Japan were among those looking at such hybrid sail-diesel powered ships. 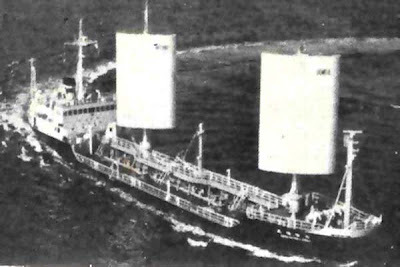 One example was the Shin-Aitoku Maru by the Japanese company Aitoku. This was an oil tanker that could unfurl computer controlled sails during wind to augment it's diesel powerplant. Computers aboard made adjustments between the sail and diesel power to achieve the most fuel efficient propulsion. Fuel savings of 10-15% were claimed over a 3 year trial period compared to a sister ship which just had diesel power. Other people are working on using sails for commercial shipping too, such as this article from 2005 shows on a car ferry design.